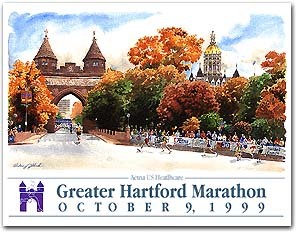 For the third consecutive year marathon artist Andrew Yelenak has designed and illustrated the Hartford Marathon's commemorative poster. Click for a large image of the painting. "Possibly the most dramatic stretch of the course for the runners, both visually and emotionally, will be the final turn and the run under the Soldiers and Sailors Arch to the finish line. 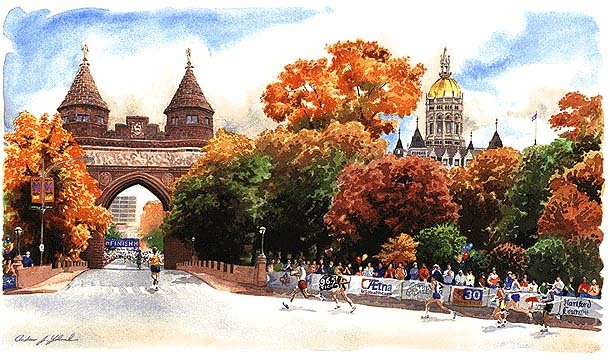 As the symbol of this race, the arch was the perfect focal point for my painting"